There is a perception that Fort McMurray is some sort of vast cultural wasteland, a place where arts and culture don't exist. Of course that perception comes from mostly outside the community, but to some degree even inside this place we call home there are those who are unaware of the rich arts and culture offerings available to us. As a writer I have been heartened to discover that there is a community of writers here, those who dabble in everything from romance to zombies, fiction to non-fiction, blogs to ebooks. And there is even a place for those writers to submit their works, a place that welcomes their poetry and stories - and even welcomes a blog post from a certain writer's personal blog, a blog post that is close to her heart. It is a blog post that I am both pleased and humbled to say will be published in a lovely little publication right here in Fort McMurray. The publication? 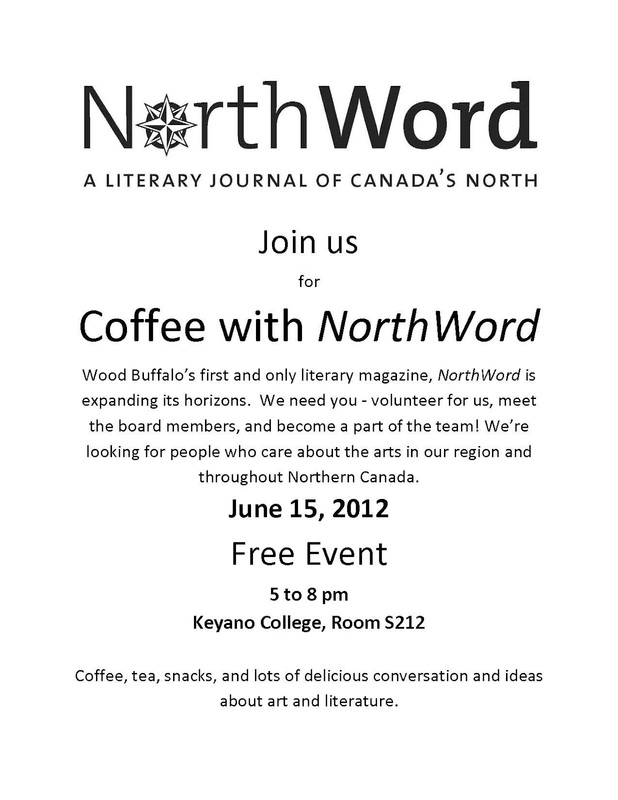 NorthWord, A Literary Journal of Canada's North. Northword is a publication started by local individuals - and it continues to be edited, published, and loved by local individuals. It is for those who love to read, and love to write. It is for those who love the written word, and for those who love to tell their stories in whatever form. NorthWord is on the cusp of some change, people. Just as this community is changing so is our literary magazine (in fact if you look around the change in this region is reflected everywhere, from our schools to our retail stores to everything else). And as they change they will need people from the community who also love the written word, people who want to be involved as Northword changes, expands, and leaps into the same new territory our community is embarking towards. 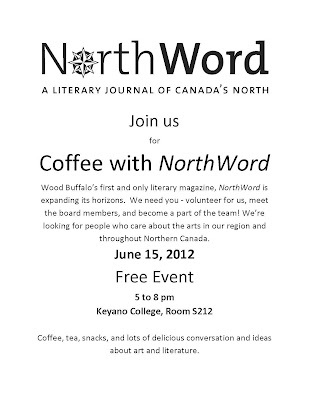 In order to explore this new territory NorthWord is asking people from the community to join them for coffee this Friday, June 15th, from 5-8 pm, in Room S212 at Keyano College. The good people from the journal would like to share with everyone the success of Northword, the excitement - and their love of the written word. They would like people who also share that love to consider becoming involved with NorthWord as board members or volunteers. I have discovered something while writing this blog. The written word matters. When I began this blog I wasn't sure of that, really. I wrote the blog entirely for myself, and never thought anyone else would care about it. What I have learned, though, is that words touch people. Words, used carefully, can heal, and words, used carelessly, can wound. Words have power. Words have impact. And words from our little northern community can spread around the world as we tell our story in blogs and ebooks and newspapers...and little publications like NorthWord, a literary journal of our northern hearts.